The Virtual Raft Project by Bill Tomlinson and others. The Virtual Raft Project is a multidisciplinary undertaking seeking to create communities of believable autonomous characters that inhabit heterogeneous networks of computational devices. In particular, the project is interested in allowing the characters to break the plane of the traditional desktop screen. To this end, we have designed an interactive installation featuring a novel tangible paradigm for interacting with the characters. 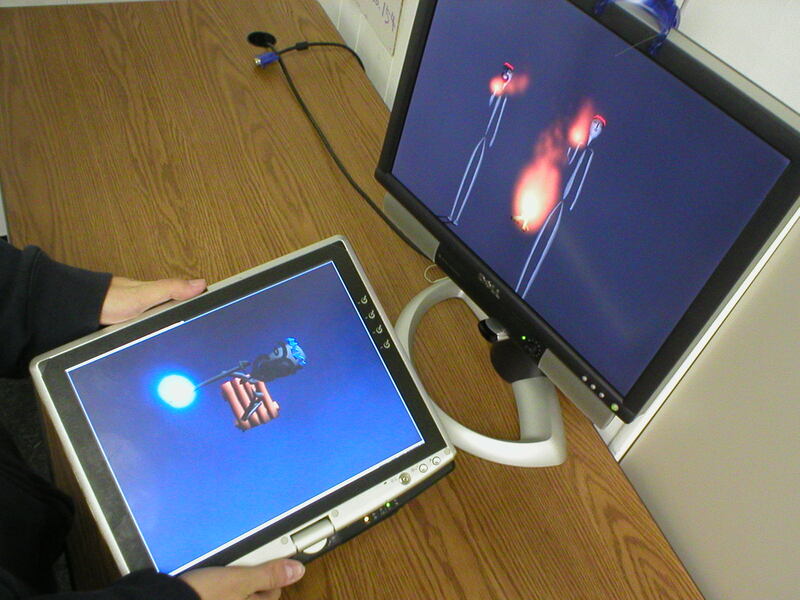 This paradigm involves the use of a mobile device, such as a Tablet PC or handheld computer, as a “virtual raft” by which a character may be transported among several virtual worlds. By enabling the character on the raft to react in real time to the raft’s motion in real space, this installation encourages participants to become physically engaged with virtual characters. We believe that this physical engagement can lead to an increase in the believability of the characters.